It's time to talk for a second about the greatest character in the Star Wars universe. Well, let's not speak too quickly here...one of the greatest characters. Because how could you possibly narrow it down to just one? Darth Vader is one of the baddest villains ever. Luke Skywalker stood up to him and defeated him, which makes him pretty cool too. Han and Chewy, Princess Leia, don't forget Yoda and his insane but effective Jedi training. And Jar Jar Binks with his crazy...ha, just kidding.. Sorry, Jar Jar, you don't get to be a part of this discussion. We're talking about Obi-Wan Kenobi, one of the greatest characters, even though it seems like he can be overlooked when it comes to fan favorites. He's a critical figure in getting Luke to finally become a Jedi. He's not afraid to stand up to space bullies like General Grievous (he confronts him in The Clone Wars and straight up kills him in Episode III) or Darth Maul (he slices him in half in Episode I). And he's got that whole dead guy spiritual adviser role down pat, as you can see from Episodes V and VI. The best things we love about Obi-Wan is his loyalty and courage in a universe gone crazy. That's also one of the reasons we love this officially licensed 100% polyester Obi Wan costume. You can almost feel the character's good vibes in an outfit like this. 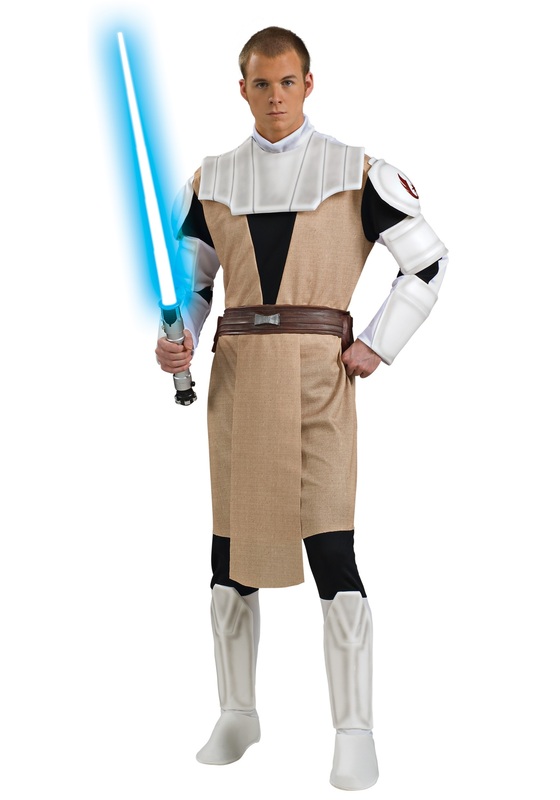 Wear it to your next comic con or Halloween party, and show some love for good ol' Obi Wan.